Press the fire button 5 times in quick succession to turn the device on and off. After switch on, OLED display DIAMOND logo and software version number at stand by mode. While the device is power on, just keep pressing the fire button to vape. While the device is power on, the OLED screen default display VW Mode. In the main menu, switch to "P" setting, press fire button to confirm. Press right and left buttons to adjust the wattage. In the main menu, switch to intensity setting, press fire button to confirm. Press right and left buttons to switch among below 4 modes. In user mode, press fire button to switch among each setting columns. Press right and left buttons to adjust the wattage. After setup is completed, press fire button to switch to "EXIT". Press right or left button to confirm. Hard Modes: 30% higher than the currently set power. In the main menu, switch to "T" setting, press fire button to confirm. Press right and left buttons to switch among Ni/Ti/SS/M1/M2 modes. Press fire button to confirm. Press right button, when "W" flashing, press right and left buttons to adjust wattage. Press left button, when "°F" or "°C" flashing, press right and left buttons to adjust temperature value. With the TCR(Temperature Coefficient of Resistance)function available now, you can customize your temperature control coils(Ni,Ti,SS) on your own. In the main menu, switch to "T" setting, press fire button to confirm. Switch to M1/M2 modes. Press fire button to confirm. In any mode, the screen shows the number of puffs. If a puff more than 0.8s, it will be recorded as one puff. The device can remember the value even if you remove the battery. The default number is "0000". When the number reaches"9999", it will be cleared automatically. Press the fire button 3 times in 2s to enter the menu, choose "SET" icon, use + and - button to choose "Screen Time" area, there are 4 preset choices, press fire button to confirm your choice, the screen will enter standby mode at the selected time. When the device connected with a new atomizer, press + and - button at the same time to calibrate the initial resistance of the new atomizer. We recommend to calibrate resistance in temperature control mode, you can make the temperature control more accuratem, please note that this operation requires heating wire cooling to room temperature. PCB temperature overheat protection: when the temperature of devices is too high, the output will shut off automatically and the screen will display "PCB TOO HOT". Low power alert: when battery voltage is below 3.2V, the device shows "LOW BATTERY". PCB Atomizer short-circuit protection: when atomizer short-circuit occurs, the OLED screen will display "SHORTED". 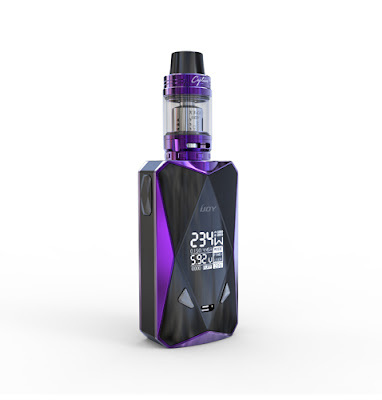 No Atomizer: when no atomizer connect, the device will display "No Atomizer".